You may be familiar with the red-and-white coffeepot towers—the trademark of Sapp Bros. truck stops. And you may know about the many other successful Sapp enterprises. However, you may not know the story of the humble beginnings of the Sapp brothers. In the early 1940s, the Sapp brothers worked on a neighbor’s farm, earning twenty-five cents a day. Half of that money they gave to their father to make ends meet. Times were tough, but the Sapp boys were tougher. Ray, Dean, Lee, and Bill survived and thrived because of a solid work ethic and an unshakable faith in each other and in God. They learned the value of a dollar in those hard days, and they never forgot it. 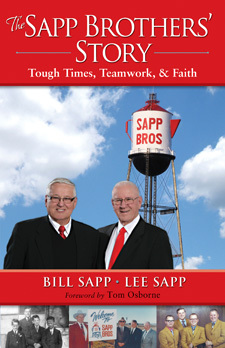 Now, the surviving brothers, Lee and Bill, tell their story—the story of how the brothers forged a relationship that became the foundation for the Sapp Bros. Their partnership began in 1960 with a Ford dealership in Ashland, Nebraska and eventually expanded to include sixteen Sapp travel centers and the largest petroleum jobber and propane distributorship in the state of Nebraska. Through it all, the Sapps have been well-known for their generosity. From sending disadvantaged youth to college to supporting athletic programs across the state to distributing more than 350,000 New Testaments around the world, the Sapp brothers have never failed to give back to their communities. Keeping integrity, faith, and humility as the focus of their professional and personal lives, the Sapp brothers have proven that nice guys can finish first and that the American dream is still alive and well.